Here you will find colour meters for both color and luminance for measuring surface colors of products. Our professional colour meters include the RGB series. With these colour meters you can read the difference in colour in L d*a*b*, L*C*H* and Delta E*ab according to your requirements. The most popular model of colour meter in our range of products is the PCE-RGB. Aside from being easy to use and economical, our colour meters are used for determining the location of a colour on the XYZ axis of non-radioactive products. The geometry of the measurement of these colours, with luminosity including a field of measurement of 8mm allow for universal use for all types of materials. The range of applications of colour meters is extensive and includes industry, agriculture, crafts, commerce, as well as reasearch and development. Furthermore, these devices are used by artisans, paint manufacturers, architects, painters and designers for testing colours (for colour card, NCS, RAL, HKS) or for establishing colours after mixing various colors. are able to give you ISO 9000 calibration certificates for colour meters or factory calibration documents. These are often needed by companies, institutes and laboratories since they need to be 100 % sure that they use exact and accurate instruments for their test series. Our partners will prepare a calibration certificate which is made for the product and you as our consumer personally. This is also the reason why the calibration certificates are not returnable. We only work together with calibration laboratories we trust and over the years they have become brilliant partners where every job get done as fast as possible and you as our customer can be sure that the job has been done more than sufficient and professional. Some of our colour meters come with software. This makes it easy to transfer the measured results to your computer to save, store and analyze them immediately or to a specific point of time in the future. The processing industries are discovering more and more the advantage of colour meters when it comes to production monitoring and quality control. In addition to that, not every person sees colours with the same sensitivity. The use of colour meters allows objective control of the colours. In some cases updates for the colour meters can be downloaded easily from the PCE server which makes colour meters more comfortable than other colour measuring devices. If you can't find the colour meters you are looking for, please contact us and we will help you find the best solution to suit your needs by calling our offices on: UK customers +44(0) 23 809 870 30 / US customers (561) 320-9162 and our technical staff will advise you regarding our measuring instruments, scales and balances and also regarding our control systems. Information about the measurement of colour: Because there are certain problems defining the different colours only with human eyes, the colour meter helps to identify different shades of colours. In our days, it gets more important to have proper colours. The colour meters help to get over the debility of the human eye. From this it follows that quality assurance is improved a lot by colour meters. Different colour spaces are classified by a coordinating system in which all of the different colours are represented by coordinates on an axis. Conditioned by the structure of the human eye and taking into account that it will be a human eye observing the colour, these colours are then placed on an axis. They are used in some 30 systems of colour spaces. The images above show the most important colour spaces. A fundamental problem of adjusting colours, in developing colour meters, is the sensitivity of the human eye. The problem is that the colour spaces don't coincide with the perception of the human eye. When colours are mixed, problems exist in the perception of the area for the colour yellow. On the other hand, with a mix of colour dominated by the colour blue, you can simulate a lighter shade of colour to the human eye. To eliminate such problems they are used in conjunction with a colour analysis frequency in such a way as to fabricate different shades. 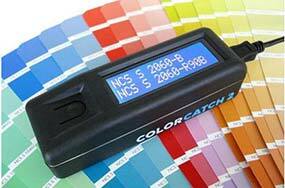 The manufacturer of a product sends a product out to be painted or treated having agreed on using an established colour standard (such as RGB colour space), both possess the same colour meter. The factory, follows the agreement, verifies the test output of the colour of the product and ships it as it meets the standard. They then continue with treating the product then check it against the frequency of its colour when it arrived. In cases where the result is contrary to the agreement, the two departments can communicate exactly about the difference in colours and use the same colour space in corresponding tests. Compared to a densitometer a colour meter / spectral photometer does not only measure the reflection of a colour by using a specific filter which allows to form a conclusion about the thickness of the coating of the object that has been coloured. Actually a colour meter measures the values of remission by illuminating the whole area of measurement with the whole spectrum of visible light which ranges from infrared to ultraviolet. Such spectral photometers divide the whole spectrum of visible light in a number of different ribbons or measurement flumes and delivers for each measurement flume a digitalized value of luminosity. Also visit our pages for Lux meters and Coating thickness meters. If you wish to view or print a selection of colour meters from our catalogue, click the PDF symbol.